Watch unlimited video race replays from all 85 racecourses in Britain and Ireland. Our extensive video archive combined with results analysis, in-depth cards, profiles and statistics provide a one-stop shop for form study. Race replays are supplied by At The Races and Racing UK and are available to watch online a short time after each race has finished. 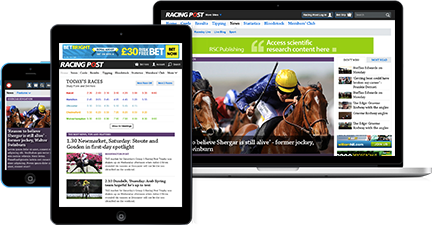 All the content from the newspaper wrapped into our superb interactive package which you can read, study and enjoy on your PC, tablet or mobile: including in-depth stories, big interviews and features, industry news, big-race previews and reports packages. Daily comment on the big issues from top racing journalists such as Lee Mottershead, Alastair Down, Julian Muscat, Steve Dennis, Tom Kerr and Richard Hoiles plus expert views from Richard Hughes and the Monday Jury. The Post's acclaimed Sunday supplement comes to life in our amazing package: including The Big Read, Celebrity Questionnaires, the wit and wisdom of renowned punter Steve Palmer, Pictures of the Week and so much more. Our improved archive gives you access to all previous news and comment on horses, people and events. By subscribing to Members' Club you have access to this wealth of information and our invaluable database. Access to the most eagerly anticipated tipping service in the business, from Tom Segal and the Pricewise team, at 8pm the night before publication in the paper. Peerless tipsters Tom Segal, Paul Kealy and Richard Birch hunt down early value in the morning's prices and deliver up-to-the-minute tips. Updated daily at 10am. Big-race ante-post value: Tom Segal and the Pricewise team hunt out the early value in the biggest races giving you unique insight and value from our top tipping service. The Edge, Tips Box, Big-race Trends, Gerald Delamere, James Pyman and more - all the statistics and angles you need to give you an edge. The Pro Card, exclusive to Members' Club subscribers, contains added features and content such as Spotlight horse comments, trainer quotes, a scratch facility so you can delete horses to make studying form easier, Racing Post ratings for every performance, own notes and ratings. The Racing Post's unique top trainer interviews to coincide with the start of the new Flat and jumps seasons. Each trainer runs through their string for the forthcoming season. Plus access the quotes throughout the season with our Stable Tours Database. Racing Post's team of expert handicappers provide ratings that assess the merit of every performance. These form the basis of the master rating for each upcoming race, handcrafted to take into account the prevailing conditions and the horse's recent form. Within every racecard you get the RPR tables which highlight the last six RPR ratings and the best RPR rating last year, for the race going, distance and course. Topspeed ratings assess a horse's ability strictly using the clock, i.e the speed of the horse in the race. Every performance is assessed against the Racing Post Standard Time for the course and distance in question, with allowances made for the elements, age and weight carried (calibrated to 10 stone for Flat races,12 stone for jumps). Within every racecard, additional TS tables highlight the last six TS ratings and the best TS rating last year, for the race going, distance and course. The Racing Post's Spotlight Comments on every runner in a race are researched and compiled by our expert team of analysts for today's/tomorrow's races, taking into account the opposition and race conditions. Our Spotlight comments are generally considered to be the best in the business. The pithy assessments help give you a concise opinion upon which to base your selection. Exclusive analysis of noteworthy performances in each race compiled by experienced race analysts and handicappers. Often a source of insight for future races, the race analysis will, where appropriate, give opinion on optimum race conditions for the future and any trainer comments on future race targets, as well as a comment about the race itself. Each race is also given a Racing Post Rating and Topspeed rating, along with a comment-in-running compiled by the Racing Post's team of on-course race-readers. Our statistics tables give you the most comprehensive statistical information you need on jockeys, trainers, owners, sires and first-crop performers as far back as 1988, highlighting performance by course, distance, win, place and betting returns. A vital tool to help with your form study. You can now enjoy punting pointers for all the action in Britain and Ireland. Who's hot or cold? Which horses are running for the first time since being gelded? Who's trying a trip for the first time? Trainers, jockeys and horses are all scrutinised to provide you with numerous nuggets of valuable information. Never miss a horse running. Simply add a horse to your stable and choose whether you want to be notified by email when they are declared at the overnight stage or entered to run in GB or Ireland. You can also make notes against your horses and follow suggested picks from the Racing Post's expert tipsters. Keep track of your own opinions with My Notes. You can add tailored notes and ratings for any horse in the database, whether on the Flat or over jumps. Three generations of pedigree to drill into, plus insight on sales data and successful relations. All easily found in the ‘Pedigree' tab on horse profiles. Exclusive discounts and free downloads on books, supplements, racecourse tickets, and other money-can't-buy offers for Members' Club subscribers only.